Trading cards for kids are fun, developmentally appropriate, and a worthwhile experience for kids. Kids can learn so many lessons and stay off of electronics in the process. Luckily, there are many different types of trading cards that may appeal to your children. Kids become interested in trading cards for different reasons. Many kids get “into” cards because of their peers. Kids might be talking about Pokemon cards — see an example — on the bus or football cards at recess or lunch at school. Yes, it’s tempting to try to let your child’s interest pass before letting them amass a collection; however, there are so many wonderful things about collecting these types of cards. For one, it gives kids something in common with kids they might not have been friends with before. When children can bond over trading football or baseball cards, they expand their social circles and get to know kids they might not have had anything in common with before. Second, kids learn responsibility and to care for their collection. They may start being interested in earning money to buy cards. Even better, it gives them something to do – besides electronics – as they get older. Kids enjoy sorting and organizing their cards and playing games with them. They are every easy to bring along on car rides. Kids enjoy making up games with Pokemon cards, Yi-Gi-Oh cards, and Magic: The Gathering cards and/or learning the actual rules to these games. Like with playing board games, they will learn critical thinking skills, taking turns, and strategy. They will learn point values and important math skills. Another benefit for starting a card collecting hobby is there are low barriers to entry. Trading cards are inexpensive and can be stored in a box already at home. If they get more serious about collecting cards, they can get a special box or use a binder with some plastic trading sleeves. They also don’t take up a lot of room and are portable. Most packs of trading cards cost around four dollars. If your child saved money or received a pack or two of cards they are interested in, you can see how likely it will be they are interested in them. However, much like with many developmental toys, Lego building, Trio, Zoob, Lincoln Logs, etc., more means more fun. Think of it this way, if your child has 50 Lego bricks, he/she can only do so much with them. However, with 2,000, there are many more possibilities. It’s the same with trading cards for kids. So while your child may own a pack of Pokemon cards with 10 cards, it will be exponentially more fun with 50 – 100+. There is an article on www.gogreentravelgreen.com called: What Kids Learn from Trading Cards. It goes on to list 18 reasons they should get some because they are such amazing learning tools for kids. Bookmark it, and check it out! 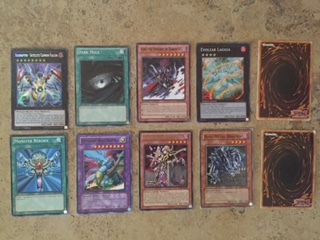 Popular cards include Pokemon cards, football cards, baseball cards, Magic: The Gathering, and Yi-Gi-Oh. There are also wrestling cards, soccer cards, college sports cards, and hockey cards. There are Star Wars cards and other specialty trading cards for kids as well. Find out what types of cards your child is interested in. One or two packs is great to start. Perhaps the Tooth Fairy leaves a pack or Santa leaves some in the stockings. Maybe your child can earn money toward them. Maybe you will get lucky and find some at a garage sale or Goodwill like my kids have found. For years, my kids’ put Pokemon cards and football cards on their birthday and Christmas wish lists. If it seems your child is getting interested in them for trading with other kids, they should have a larger variety from which to trade. Again, 50 – 100+ at the very minimum. If your children have enough cards, they can play games with them, even made up games, with their Yu-Gi-Oh or Pokemon cards. Again, trading cards are sort of like Lego bricks. The more they have, the more fun it is and the more they can do with them. Set your kids up for success by allowing them to have a system that works for storing the cards. You may have to use trial and error to see what works best for the way in which your kids use their cards. You will want to consider tins, boxes, and binders. Whatever system you and your child choose, it has to work for him/her. Will your child be bringing the cards in the car? Will he want to spread them out to play or will it be better to organize them in a binder? Tins: If your child gets a Pokemon tin, that’s a great place to store scores of cards. Shoe box: A shoe box or other box is handy. 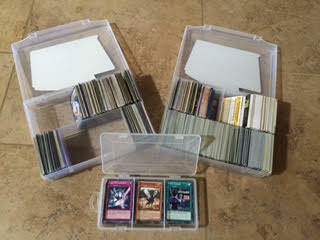 A plastic box made to carry and store trading cards is a great way to store, sort, protect and access cards. It will protect them from spills and make it easy to tote in the car, to stack evenly in a closet, etc. It even has a carrying handle. The best box we’ve found is a small plastic box that holds 1,100 cards (here it is). It has five dividers and is great for a large collection or to house multiple collections. These boxes are made for trading cards and are great for storing and sorting. Oftentimes, my kids put several different types of cards in the box to take with them in the car to sort, discuss, trade and play with. You can buy a specialty trading card binder or use one you already have. The important thing is the plastic trading card pages which hold all types of standard trading cards, nine to a page. These pages have sleeves which fit all regular-sized baseball, football, basketball cards, Yu-Gi-Oh, Pokemon cards, etc. You can find them at Target or Walmart. The fact that cards will be “in” and then “out” is something to know and expect. Try not to be upset with your kids when they put their once-loved trading cards aside. It’s like with anything else: Your child will be interested in things more at certain times and less at other times. It may well depend on what their peers are interested in at school. The difference with Pokemon cards and football cards, etc. is that usually they will come back “in” again. Depending on the age your child starts to collect the cards will let you know how many more years you have left with them. There are teenagers who still enjoy them. However, the big talk at school will generally not include Pokemon trading as kids get into the older grades. 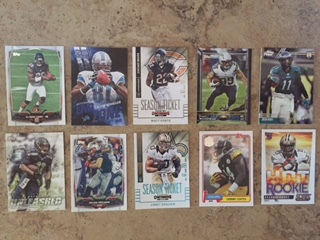 It seems that football cards start being popular when in kids are in 2nd grade. These seem more timeless as kids even in much older grades are still interested in them. 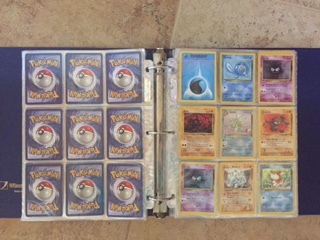 However, a difference with sports cards instead of Pokemon cards is that kids seem as happy with older Pokemon cards, even from their date of origin: 1995 (great to find at garage sales, Goodwill, etc. ), but it seems with football and sports cards kids either like certain teams, certain types/brands of cards, and certain players. Often this includes current players. Encourage your kids to keep their trading cards for later use or for when they are adults. They don’t take up room, and stored properly, they will last. Trading cards for kids can be a great developmental learning experience as your children get older. Encourage your child’s card-acquiring interest, however short-lived. Just as when they first decided they wanted to try t-ball or soccer, your child is learning more about the world and their place in it. Maybe collecting cards will be something they stay interested in and want to continue pursuing. There isn’t much they need to get started. Not only is it a timeless hobby, it keeps them off electronics. Also, it will keep them occupied even as they age out of their toys. Remember to keep the cards for a few years even after your kids are done playing with them. Chances are, they will circle around to them again. I’m making my kids keep their cards for their kids!